Properly Established and maintained lawns are a lifetime investment, adding to the value of the property. It’s safe, clean and enjoyable use and even a benefit to the environment as the tightly inter-woven plants of a mature lawn clean the air by releasing oxygen as it uses carbon dioxide, traps particulate pollution and cleanses runoff water that helps restore our groundwater supplies. Making the wrong decisions when your lawn is established will cost you time, energy, money and natural resources. Making the right decisions when your lawn is established will give you a beautiful, usable and enjoyable investment. Listed in the box on back are a number of important elements to consider in establishing a lawn for home, commercial or recreational use. Following each element is a description or particular characteristic for seeded, hydroseeded or sodded lawn establishment. Differences between seed and hydroseeded areas are noted where appropriate. 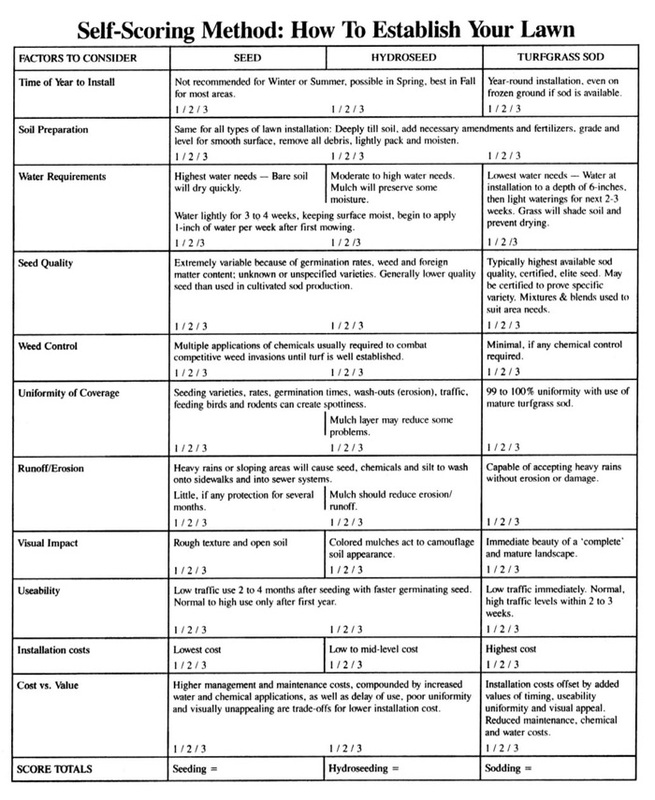 To complete the process on back, review each element and the descriptions, which follow for seed, hydroseed and sod. Based upon the importance you give each element, mark a single box score for one method of lawn establishment. Example: “Time of Year” is critical to you because of seasonal weather extremes. Because sodding’s characteristic is most advantageous to your needs, you would mark the number 3 and go to the next question. Seeding or hydroseeding would not receive any score. Total all scores after you have reviewed and marked each question. The highest point total will indicate the lawn establishment method that best suits your overall needs.